One of America's two best newspapers may be under assault in all the usual 21st-century ways, and its Lakewood-born editor Len Downie may be sending out memos about the need to shorten articles. Yet, it still somehow continues to serve up great journalism every day. 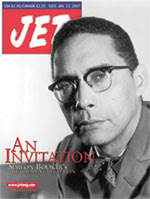 This 6,200-word masterpiece, published last week in the paper's Sunday magazine, tells the story of black journalism pioneer Simeon Booker, of Jet Magazine. It even contains a surprising Cleveland twist (he worked for a few years in the '50s at the Call & Post, and says he briefly considered applying at the Plain Dealer, before realizing they already had their lone black reporter). Just please read it when you get some time. I promise you won't be disappointed. You can read the transcript of an online discussion with the author of the piece, or listen to this NPR interview with author Wil Haygood.